Railpictures.ca - Doug Lawson Photo: At the small shop facility at Murray on the BC Rail Tumbler sub, 6001 is waiting for some servicing and inspection. The shop here could do most service, inspections and lite repairs. 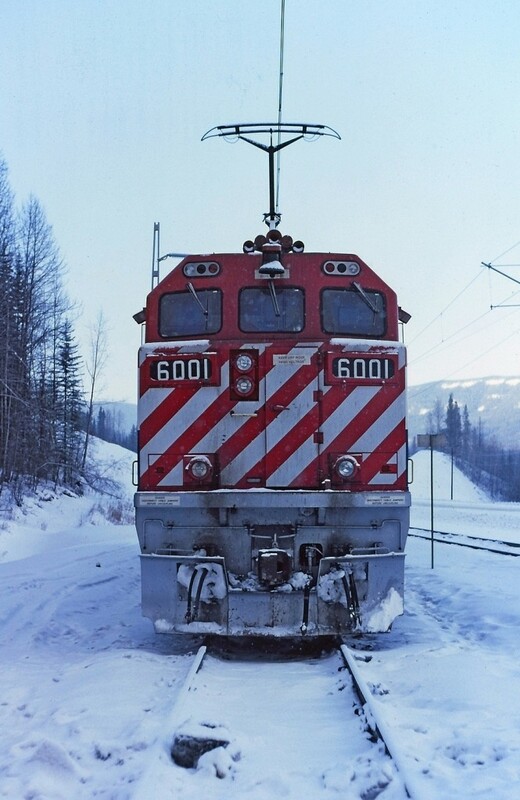 For anything major such as wheel change, truck change out or anything requiring a heavy overhead crane, the locomotives had to go to the larger shop in Prince George. Note the offset headlight. The front door was really never used and the short hood area was a very cramped confined space and could be accessed from inside the cab. Brilliantly placed down in the short hood was the handbrake and for anyone over 2 feet tall it was quite a feat to get in there to apply or release the brake. I found the units to be noisy and rough riding. I could not locate the lat /long on the map. | Railpictures.ca – Canadian Railway Photography – photographie ferroviaire Canadienne. Caption: At the small shop facility at Murray on the BC Rail Tumbler sub, 6001 is waiting for some servicing and inspection. The shop here could do most service, inspections and lite repairs. For anything major such as wheel change, truck change out or anything requiring a heavy overhead crane, the locomotives had to go to the larger shop in Prince George. Note the offset headlight. The front door was really never used and the short hood area was a very cramped confined space and could be accessed from inside the cab. Brilliantly placed down in the short hood was the handbrake and for anyone over 2 feet tall it was quite a feat to get in there to apply or release the brake. I found the units to be noisy and rough riding. I could not locate the lat /long on the map.